The sound of hammering echoed in the air. Raiz and his comrades were working at the construction site where the new Monsters’ Delivery’s base would be built. Since their former office was destroyed by the storm, they needed a new one. The carpenter did him a favor regarding the payment time, but Raiz was both grateful and sorry at the same time. Given the circumstances, he periodically tried to help his lifesaver, trying to cover at least the basic expenses. 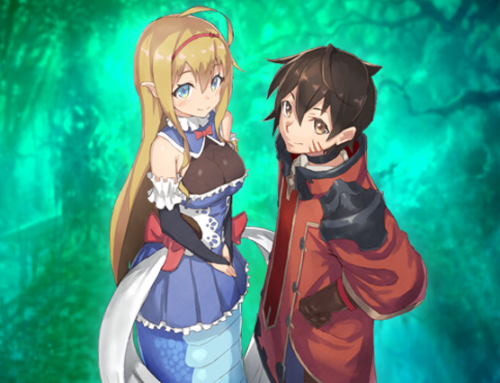 He also offered Lamia’s wages, but her salary wasn’t really great, so Dragon’s earnings became fundamental. We need to pay the carpenters as soon as we can. We should try not to be a bother. They all knew that the workers’ life was quite stressful, so Raiz was racking his brain to find more ways to earn money and settle his debt. But the workers in question looked satisfied. A busy worker called her from the second floor, so Lamia prolonged on her tail and squeezed him from behind to make sure he wouldn’t slip and fall down. The man seemed in bliss from the moment her arms embraced him to the moment he was released. None of them cared about the delayed payment at all. Suggested Dryad, showing them a barrel filled with water she made by entangling her vines. After the master carpenter’s order, the workers started to leave the building under construction and headed toward the girl for some refreshments. “It’s just water,” she chuckled. They were only trying to flatter her but were actually right. The water she brought wasn’t normal. It was morning dew enhanced with her magical power, which helped the recovery from fatigue and also replenished magical energy. They weren’t aware that if bought from a magic tool shop, a single cup would have been worth one silver coin. Raiz asked the master carpenter. The monsters volunteered to help, and they were doing a wonderful job. For example, Entering the forest to cut down trees was dangerous because monsters would attack people, so Raiz’s subordinates took their place. Also, they would have had to wait for the wood to dry inside out, but Dekuch was located in the eastern part of the Kingdom of Tend, where the rainy season was a big deal. Drying timber was a process that took both time and money. Thanks to Raiz’s monsters, that process was highly hastened. The trees were brought to a hut where Salamander had lit a fire, and Harpy flapped the hot air over the wood to make it dry earlier. That way, the waiting time was drastically decreased. Also, thanks to Treants and Minotaurs’ strength, more material could be transported at once, and little monsters like kobolds helped with simple tasks according to the carpenters’ instructions, letting the workers focus on precision work. The master carpenter said cheerfully to the working Minotaurs. An expert relied a lot on its sixth sense, and its way of doing things was greatly different from an apprentice’s. Learning how to do it properly took time and honing one’s skills was a process of trial and error. Gathering many experienced craftsmen was usually the best way to create something amazing. Said the master carpenter as he started to choose the better suited men for the task. If we learn enough from them, we might be able to repair our new house if it breaks. In that case, the repairing fee wouldn’t be very high. Raiz accepted what the carpenter told him without objecting. He let out a deep sigh and looked at what was going to become his new house. The roof was entirely made of wood, some of which was recycled from the old hut. Since it was still under construction and didn’t have any walls, they planned to let the wind pass through the building to mitigate the damage. Raiz heard a voice and turned to see who just talked. Two figures were walking toward the house with their faces concealed by hoods. It looked like they were searching for Raiz’s house, but since it was destroyed, the workers were building it anew, so it wasn’t easy to understand what was happening. “Why are you asking me! Anyway, he should live around here… Ah! There’s someone there! A woman’s voice reached the tamer. He was perplexed. She had some business with him but fell silent all of a sudden. The other figure got closer and asked with a male voice. The man took off his hood revealing a handsome face. Raiz’s gaze set upon the other figure, who looked startled at first, then mastered her courage and revealed her face. Her confident eyes were betrayed by her embarrassed look.